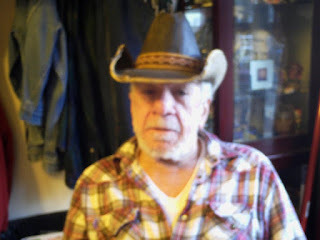 Jim wore a cowboy hat always. And boots. Except during Ninjitsu training. As an octogenarian. I never saw him train, but I heard about it. Whenever we sat together in the parking lot waiting to pick up children from school (my kids, his grandson). Or at the park. Or at his home where he'd decorated the hell out of Halloween season and thrown a party for his grandson's birthday. The last time I saw him was at one of those parties. 20 teenagers running around the back yard in costumes shooting Nerf guns at each other, hopped up on sugar and nitrates. I loved the parties and it was clear the kids did too, but it wore me out just looking at the scene. Not Jim though. He thrived on it. He had energy to spare. He damn near broke my fingers shaking my hand. He wanted me to know there was coffee in the house. He always made sure to make coffee if I was coming over. He knew I liked it. He liked the way my wife made coffee when he visited our home. "She makes it strong." Jim told me stories with a little prompting. He ran away from home at 14. Never saw his father again. Joined the Marines. 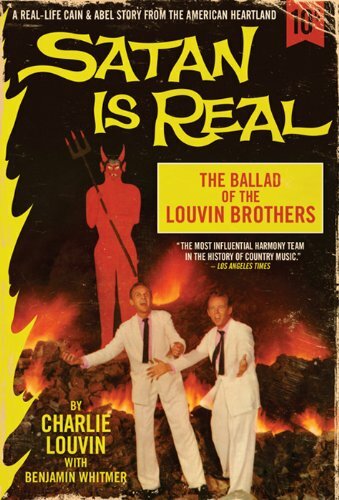 Played in a country western band with his brothers on a honky-tonk circuit. Tended bar at a rough joint in St. Louis. Got in fist fights. Whiskey bottle fights. Gun fights. The stories he told me brought to mind Charlie Louvin's tales and I got him a copy of Satan is Real by Charlie (and Benjamin Whitmer). Jim loved it. He bought copies for his surviving brothers. He took care of his siblings during their declining years, often driving all over Missouri and Illinois to work on their homes or take them to medical appointments when they were ill or unable to themselves. I knew Jim throughout his seventies as a kind man with a sweet disposition toward me and my family. But I know not everyone who knew him had the same experience. Jim told me of estranged family members from generations before and after him. He wanted to talk about hard things. He'd had meanness demonstrated to him young and had responded in kind frequently throughout his life. He figured he'd changed some. He didn't know about grace. He asked me questions about Jesus. He believed in God most days. He had opinions. We didn't see eye to eye on many things. I hated his politics. He cut me some slack, but figured people who thought like me were a big problem. I didn't argue much. I listened. It was easy to. Jim had so much story to share. 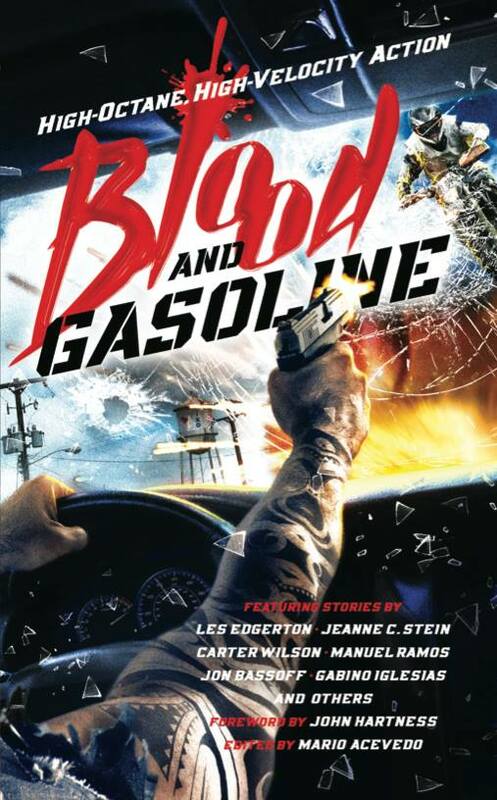 Full of humor and heart and violence. 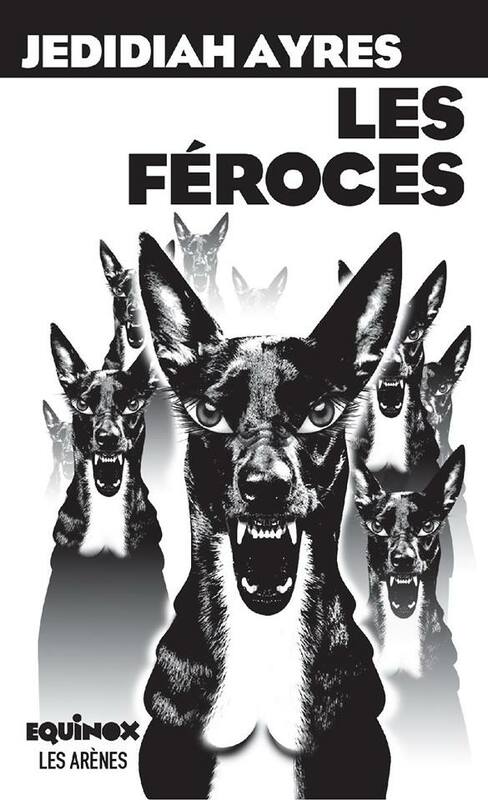 Beautiful and terrifying in the unvarnished presentation. I wish I'd taken more extensive notes about his life. I told him I'd like to use some of his biographical details in my fiction and he was thrilled. He read my book and said I had the stuff. Nothing gives me more confidence in my merits. For the last 80-some years Jim lived. 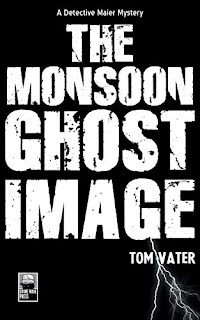 Tom Vater's latest book, The Monsoon Ghost Image is the third in his series featuring Detective Maier, the Asia-specialist for a German detective firm (after The Cambodian Book of the Dead and The Man With the Golden Mind), this time pitted against the CIA, corrupt international business interests and 'The Wicked Witch of the East' in Thailand. 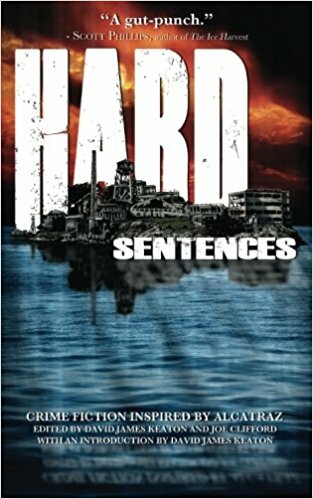 The following is his first-person account of interviewing serial killer Charles Sobhraj in prison. Keep up with Tom at his website TomVater.com. Indian parents tell their children that Charles Sobhraj will come and eat them if they are naughty. That’s what crossed my mind as I walked with Canadian photographer and documentary film maker Steve Sandford through the gate of Kathmandu prison – which looks like a Spaghetti western film set, much like its watch towers and armed guards – into the visitors’ area, a long narrow room, split in half by a low wall and strong chicken wire that reached up to the ceiling. Visitors had to sit down on stone benches. To our left and right families were shouting across the low wall, through the chicken wire to their incarcerated relatives. This was Christmas 2003 and we were here to interview a man infamous and feared across a continent. Charles Sobhraj, one of the world’s most notorious serial killers, was awaiting trialin Nepal and had agreed to grant us an interview. So had the prison authorities. Charles Sobhraj spent more than twenty years on the road across Asia befriending backpackers, drugs-smugglers, diplomats and businessmen, then drugging, robbing and finally strangling or burning his acquaintances. He is said to have killed between twelve and twenty times. The now seventy-four year old has been on the run from police in Hong Kong, Thailand, Nepal, Pakistan, Afghanistan, Iran, Turkey, Greece and France. Sobhraj, son of an Indian textile merchant and a Vietnamese woman, had a tumultuous childhood, growing up on the streets of Saigon and in juvenile prisons in France. Neglected by his family, the young Sobhraj moved effortlessly from petty crime to armed robbery and finally to murder. By the mid-1970s, a career that included jewelry theft, luxury-car smuggling and massive gem stone fraud was interspersed with kidnappings and torture of drugged foreigners. In South Asia, Sobhraj was known as the “Serpent’ for his mastery of disguise, his multiple identities and his ability to persuade people to assist him with his killings. With the help of several female assistants, Sobhraj poisoned his victims and then pretended to help them recuperate, while administering more poison. But by the late 1970s Interpol and numerous police forces across Asia were on the look-out. 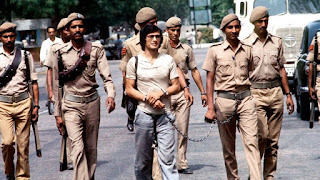 Sobhraj was convicted for two murders in Thailand in 1976, which earned him the name ‘Bikini Killer’, but he was never caught for these crimes. French woman Stephanie Parry and American Teresa Knowlton had been found in shallow graves on beaches near Pattaya, Thailand’s notorious red-light beach resort. The police took months to connect the decomposed bodies to a mysterious gemstone dealer in Bangkok. By the time the local authorities were alerted by a number of suspicious embassies in Bangkok that Sobhraj was using false papers, the “Serpent” had allegedly paid off the Thai police and fled the country. He admitted these and other murders to a journalist Richard Neville in 1977, which were published in the bestseller The Life and Crimes of Charles Sobhraj. The Thais eventually charged Sobhraj with five murders. Autopsies after exhumation revealed one of the girls in Pattaya had been drowned, the other strangled. 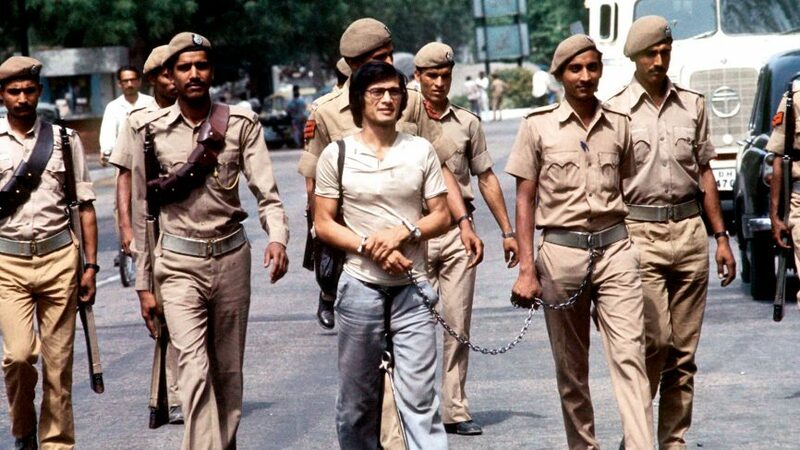 Charles Sobhraj was also charged with the murder of a Turkish man, who had been burned alive. 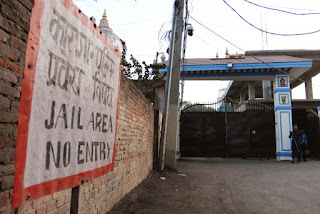 With evidence provided by several embassies, the Thais also investigated Sobhraj for the murder of two Dutch tourists – Sobhraj had used the Dutch man’s passport to escape to Nepal. The Dutch couple, who had been staying in Sobhraj’s apartment in Central Bangkok, had been kept prisoner, drugged, beaten, strangled and burned to death. They were found in a ditch near the capital. The world was closing in on Charles Sobhraj. In 1976 he poisoned a group of French students, as part of an elaborate gem scam at the Vikram Hotel in Delhi. For once Sobhraj got it wrong and miscalculated the dose for the students who became violently sick. Some of his victims realized they were being drugged, wrestled Sobhraj to the ground and held on to him until he was arrested by Indian police. Sobhraj went to court in Delhi. By 1977, Thailand had issued a murder warrant for Sobhraj. Nepalese authorities wanted to interview him about two backpacker-killings (though he was not charged in Nepal until 1986). The Delhi court charged him with murder, for killing Jean-Luc Solomon, a backpacker he had allegedly poisoned. In 1977 Sobhraj was found guilty of administering drugs with intent to rob, causing hurt to commit robbery and the Indian equivalent to manslaughter -- culpable homicide not amounting to murder. 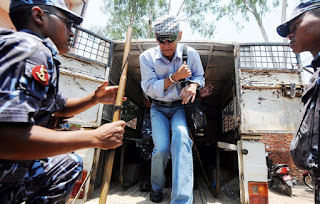 Sobhraj was sentenced to seven years for manslaughter and an additional five years for poisoning. He was sent to the notorious Tihar Jail, which he soon ran like a company, controlling business within the prison walls, paying off guards and enjoying freedoms no other prisoner could hope to attain. In 1986, just prior to his release, he escaped by drugging guards and prisoners alike at his birthday party. A few weeks later he was recaptured in Goa with a weapon. 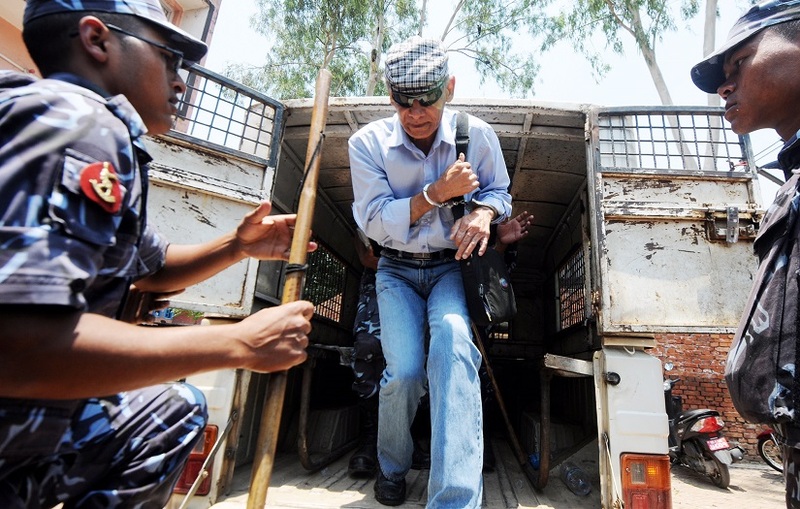 Sobhraj was keen to avoid extradition to Thailand where he faced the death penalty. In 1997, after numerous hunger-strikes, escapes and recaptures and twenty years behind bars in India, Sobhraj was released and returned to France where he embarked on an apparently profitable career as a killer celebrity, signing film deals. So here we were, on one side of the chicken wire. And opposite us stood Charles Sobhraj, legs and arms shackled. We were flanked by two police officers, Sobhraj was surrounded by three officers. The walls were dirty yellow, the light beamed down from a neon strip above our heads, it was gritty. We were not allowed to take photographs, make recordings or take notes. Sobhraj was a charismatic man, even in his old anorak and woolly cap, (soon after the interview I watched The Silence of The Lambs and found it unbearably flat-footed and vulgar) and he was watching us like a hawk as we introduced ourselves and told him that we’d come to write a story about him. Through the wire, he looked perfectly reasonable, projecting the air of a French university professor, the assured spiel of an Indian gem stone seller and the rough skepticism of a Vietnamese soldier. 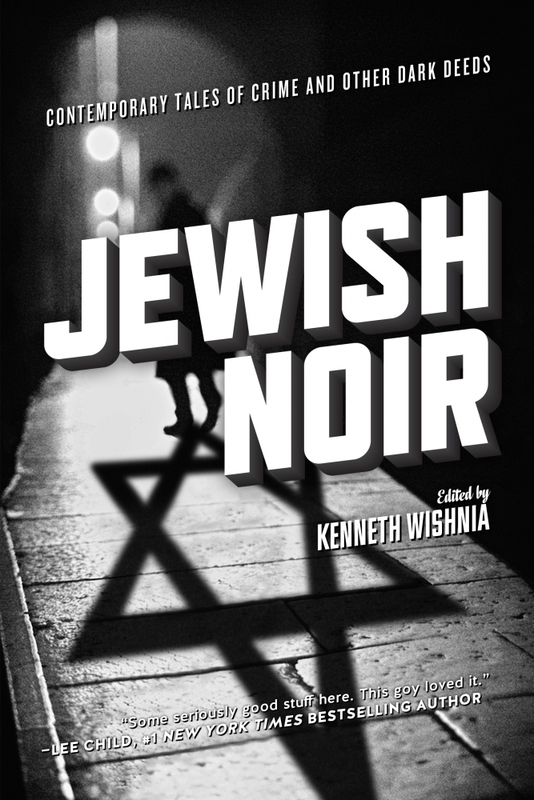 His accent flitted between his personas, as if trying to evaluate which version of himself would work best with us, or on us. I guess he saw us as a prize catch, rotting away in his cell, waiting for something to happen, even if it was no more than the appearance of a couple of foreign freelance journalists. As a ten year old, Ganesh had stumbled across the crime scene of one of Sobhraj’s two Nepali murders. In September 2003, he’d arrested the prime suspect in Nepal’s worst tourist murder. According to Kathmandu police, Sobhraj drugged twenty-six year old Canadian Laurent Carrière and twenty-nine year old American Connie Bronzich, then stabbed them and partially burned them, before dumping the bodies in two separate locations, one near Kathmandu airport and the other in a field near the UNESCO World Heritage Site Bhaktapur. It was somewhat laborious to direct him back to the subject we had come for, his recent arrest in Nepal. With the help of a personal organizer he launched into his life story, with minute facts and names, at times quoting the books that have been written about him, but without alluding to having killed anyone. It was a weird hour long pantomime in the crumbling, freezing-cold jail. Given Sobhraj’s track record, Ganesh K.C. was remarkably calm about his dangerous prisoner, “He is kept under special security arrangements because he escaped from Tihar in India so many times. But he will not elude custody here. Charles Sobhraj made a huge mistake returning to Nepal.” Outside the jail, a few Sobhraj groupies had gathered to visit their idol. 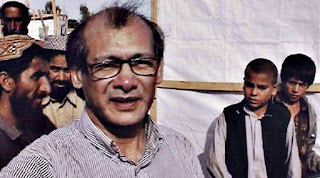 An American waiting for his idol with a bag of oranges, told me, “Asking why Charles Sobhraj kills, is like asking why the sky is blue.” Another told us he’d spring Sobhraj dinner upon his release. In 2004, Sobhraj was convicted to twenty years in prison for the murder of Connie Bronzich. The verdict was upheld by Nepal’s Supreme Court in 2010. In 2014, Sobhraj was convicted to another fifteen years for the murder of Laurent Carrière. A couple of weeks ago, I was back in Kathmandu. I happened to walk past the city jail. There’s a new gate, a big iron affair, a little more with the times. But above on the prison wall, guards still patrol with automatic weapons. Somewhere in the bowels of the jail. Charles Sobhraj lingers and I can’t help thinking of all things I have done, seen, felt, lived and survived, the books I have written, the people I have met, since I first walked through those gates fifteen years ago. I also thought about the many people I have met who have been incarcerated unjustly, or for too long. Charles Sobhraj is not one of them. 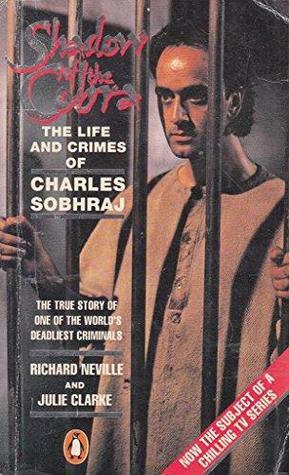 As Sobhraj slips into old age, as his biographer Richard Neville, incidentally one of the founders of the UK’s legendary OZ Magazine, passed away in 2016, and as the big film about the drifting hippie killer was never made, his name, his crimes and his charisma will fade. Children in India will be scared by other popular culture bogeymen. 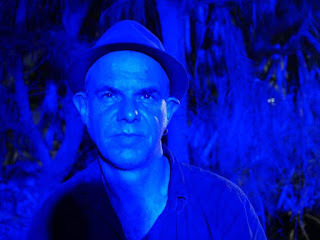 Tom Vater is an Asia-based writer and journalist. He is the author of numerous books, mostly on Asian subjects, including four crime fiction novels. 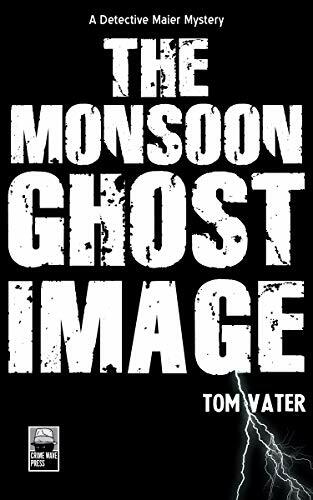 His most recent novel, The Monsoon Ghost Image, is a detective mystery unfolding in Thailand, on the fringes of the US’ war on terror, published in October 2018 with Crime Wave Press.